A have the similar issue. Based on wiki by hydrogenaudio: What's the best AAC encoder? 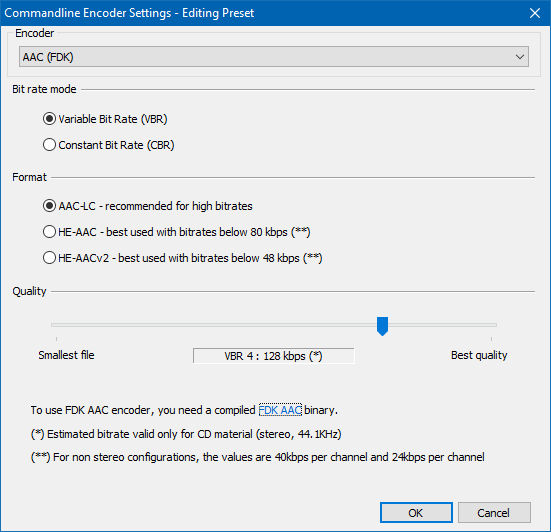 information I wanted to use the 2nd most recommended AAC(FDK) encoder. I use foobar2000 (v1.4.3) with Free_Encoder_Pack_2018-10-19. The foobar2000's link directs me to Cabinet site. I downloaded the "fdkaac_autobuild.zip" file to create "fdkaac.exe". However executing install-mingw.bat does not create it. How can I get a most recent "fdkaac.exe"? Surprise ... install-mingw.bat installs MinGW. Only. If you want to build fdkaac, why not run build_fdkaac.bat after installing MinGW? P.S. : This script is not updated anymore; but the media-autobuild_suite can do it as well (besides building a lot more codecs, and finally ffmpeg using them all). MinGW and MSYS are installed under current directory. Sub directories such as bin, include, lib,... are created. When the 1st step fails the other steps does not do anything. I just wanted fdkaac.exe however there were near 50 another question which most of them I did not know what it is. It was written ffmpeg is more recommended to create aac audio than fdkaac. Does it mean wiki by hydrogenaudio: What's the best AAC encoder is not correct? It says ffmpeg is the last in quality. This media-autobuild runs since15 minutes. It is the most overcomplicated process ever seen to get one single "fdkaac.exe" file. Fraunhofer FDK AAC and CLI QuickTime AAC/ALAC encoder both available just an exe file would be needed. More than one hour running for nothing. It did not create fdkaac.exe file. Are there any way to create aac audio by apple or fraunhofer aac?